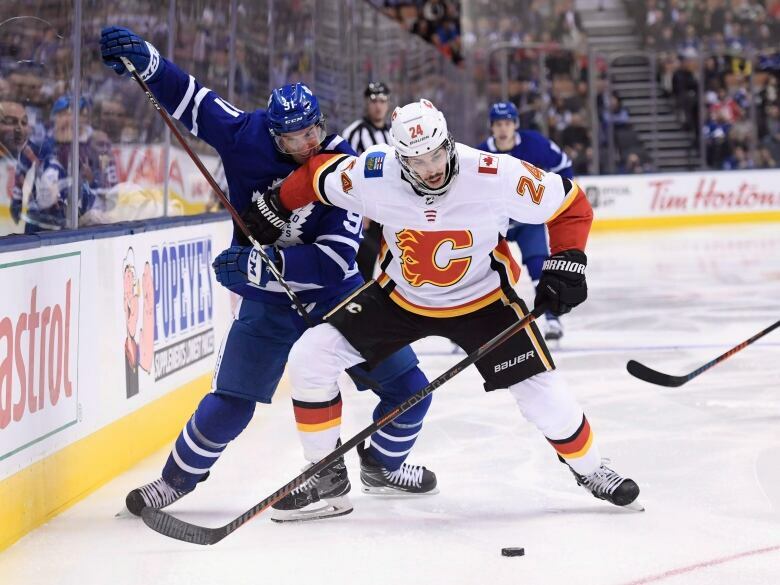 Sean Monahan and Elias Lindholm scored 55 seconds apart in the third period as the Calgary Flames downed the Toronto Maple Leafs 3-1 on Monday. Booed out of their own building at the conclusion of an embarrassing 9-1 loss to the Pittsburgh Penguins last week, the Calgary Flames had a decision to make — feel sorry for themselves or recommit to their defensive structure. Choosing the latter has paid immediate dividends. 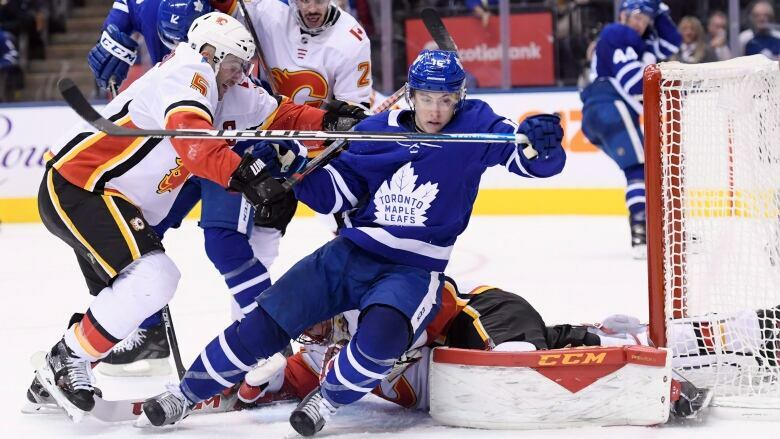 Sean Monahan and Elias Lindholm scored 55 seconds apart in the third period as Calgary smothered the Toronto Maple Leafs 3-1 on Monday to snap a three-game losing streak. Hockey Night in Canada podcast: Should goalie gear be one size fits all? Lindholm and Monahan also had an assist each for Calgary (6-5-1), while Mike Smith made 24 saves. Michael Frolik added an empty netter late to seal the win. The Flames took a step in the right direction after the disastrous Pittsburgh effort by battling back to force overtime against the Washington Capitals on Saturday before falling 4-3 in a shootout to the defending Stanley Cup champions. They went one better against the listless Leafs, who lacked jump without Auston Matthews after it was announced earlier in the day the star centre would miss at least four weeks with a left shoulder injury. Nazem Kadri, playing his 500th NHL game, replied for Toronto (8-4-0). Frederik Andersen stopped 31 shots in the loss. Monahan snapped a scoreless tie 4:39 into the third on a power play with his fifth of the season and first in nine games off Lindholm's rebound. The native of nearby Brampton, Ont., then forced a turnover in the Toronto zone before Johnny Gaudreau found Lindholm, who beat Andersen at 6:34 to double Calgary's lead. "We stepped it up," Monahan said. "We've got to start earning wins by ourselves." Toronto defenceman Igor Ozhiganov hit the post at the other end on the next shift, with teammate Zach Hyman unable to get to the loose puck. The Leafs, who missed the net 20 times and had 13 shots blocked, got to within one at 16:07 when Kadri scored his third of the season and third in as many games on a feed from Mitch Marner one second after a Toronto two-man advantage expired. Hyman celebrated as if the Leafs had tied it on a deflected Morgan Rielly point shot with 1:27 to go, but the puck hit the outside of the mesh and landed on the back of the net instead of entering the goal, leading to some confusion on the ice and the whistle being blown. The Leafs continued to press, but were unable to get another one past Smith before Frolik iced it with his fifth as Toronto fell to 3-4-0 at home. Smith, who allowed six goals on 21 shots against Pittsburgh before bouncing back with 24 saves against Washington, said the Flames put in their best effort of the season. "We've just played together as a team, made it hard on two really good hockey teams to transition and get any rush chances," he said. "It's hard to play like that, but it's rewarding when you. "We have a standard now." Andersen kept things scoreless early in the second when he stopped Lindholm on a delayed penalty, and Smith did the same to Hyman at the other end. The Leafs goalie stopped Matthew Tkachuk and Mikael Backlund in quick succession before John Tavares shovelled a loose puck off a scramble into Smith's open cage just after the buzzer went to end the second period. The 21-year-old Matthews, who doesn't require surgery for his damaged shoulder, was hurt on a clean check by Jets defenceman Jacob Trouba early in the second period of Saturday's 3-2 comeback victory over Winnipeg as the Leafs forward cut to the net. Matthews sustained a similar injury to his other shoulder last February and missed 10 games — his third stint on the sidelines in 2017-18 following back and concussion problems — but still managed to finish second on the team in goals (34) and points (63) in just 62 appearances. Matthews has 10 goals (tied for second in the NHL) and 16 points (tied for sixth) through 11 outings this season — a ridiculous 75-goal, 119-point pace in an admittedly small sample size — despite being held off the scoresheet for 10 straight periods before getting knocked out. "It's frustrating," Matthews said prior to Monday's game. "I'm going to work as hard as I can to get back as soon as possible."